The legendary drummer tragically died yesterday (28.12.15) and his bandmates have paid tribute to their "great friend". Taking to Twitter, the group wrote: "It is with deep regret that we say goodbye to our great friend, the world's greatest drummer, our beloved Brad. RIP. (sic)"
The family also released a statement, describing the late John as a "powerhouse" behind the group. They said: "It is with deepest regret that we have to announce the very sad news that our much loved husband and father John 'Brad' Bradbury passed away on Monday the 28 of December. 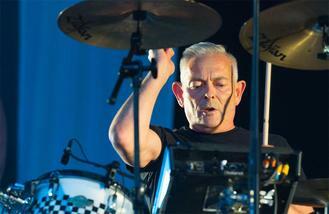 "Brad's drumming was the powerhouse behind The Specials and it was seen as a key part to the Two Tone sound. He was much respected in the world of drumming and his style of reggae and ska was seen as genuinely ground-breaking when The Specials first hit the charts in 1979. The cause of death has not been detailed publicly.